This post is sponsored by Lindt Chocolate. These rich Brownie Cupcakes with Fudge Frosting are chock-full of Lindt Chocolate and even have a little morsel of chocolate baked into the center! Can we talk for a minute about brownies? I just love a nice, thick, rich, fudgy brownie, don't you? If I had my choice of chocolaty treats, I'd go for the frosted chocolate brownie every time. I like the dense texture, the intense chocolate flavor, and I adore a sweet chocolate brownie frosting. Oh, and when the edges get all chewy...yum times 10! Times 100! Uh, just so darn good. When I decided to join in the #Choctoberfest fun this month, I knew right away that I would be making brownies. But, not just any old brownies. Oh, no. There is nothing ordinary about my brownies. You see, one of the sponsors of #Choctoberfest is Lindt Chocolate. If you have not experienced the sweet decadence of Lindt Chocolate, well then, you simply have not lived. 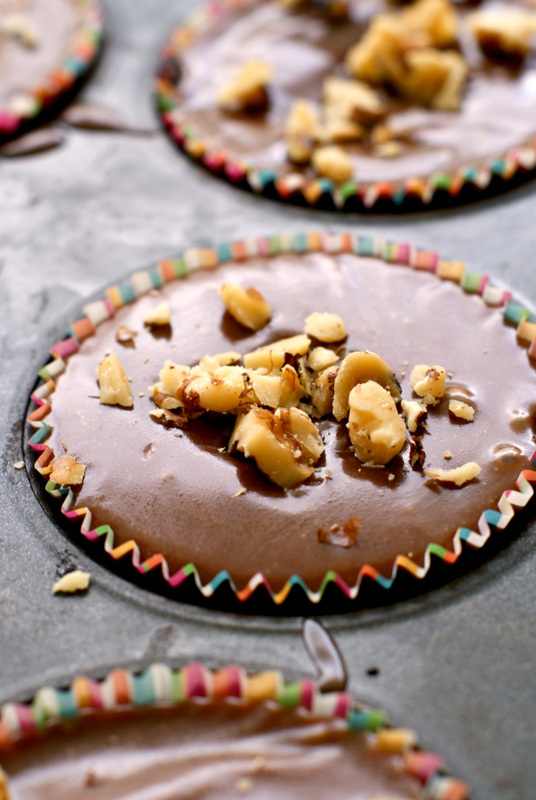 I used that glorious Lindt Chocolate in every element of this recipe. There is a melted Lindt 70% Cocoa EXCELLENCE Bar in the brownie batter and there's Lindt Milk Chocolate CLASSIC RECIPE Bar melted into the icing. 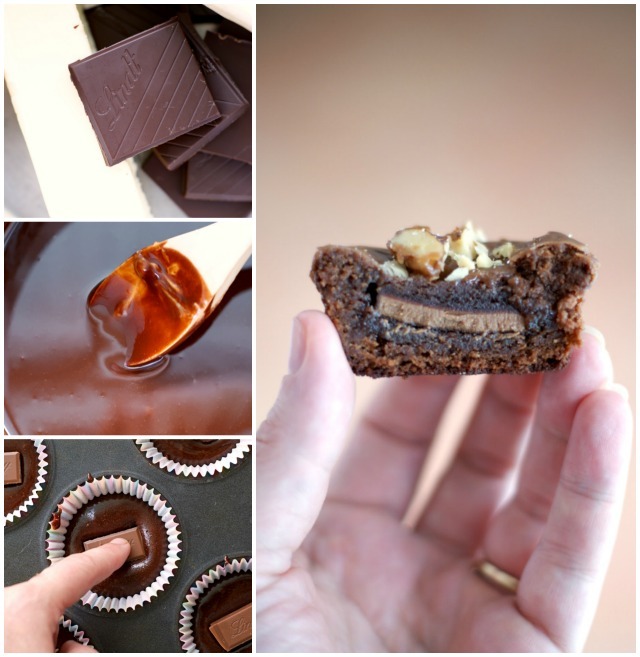 And let's not forget that little bit of chocolate tucked inside the center of each brownie. You're welcome. Remember those chewy brownie edges that I told you I love? That's why I made these babies into brownie cupcakes. More edges touching the pan means more chewy goodness. I added the cupcake liners to avoid sticking and because I thought the idea of a brownie cupcake was too cute! They turned out to be the perfect combination of everything I love about a brownie in a cute little cupcake form. 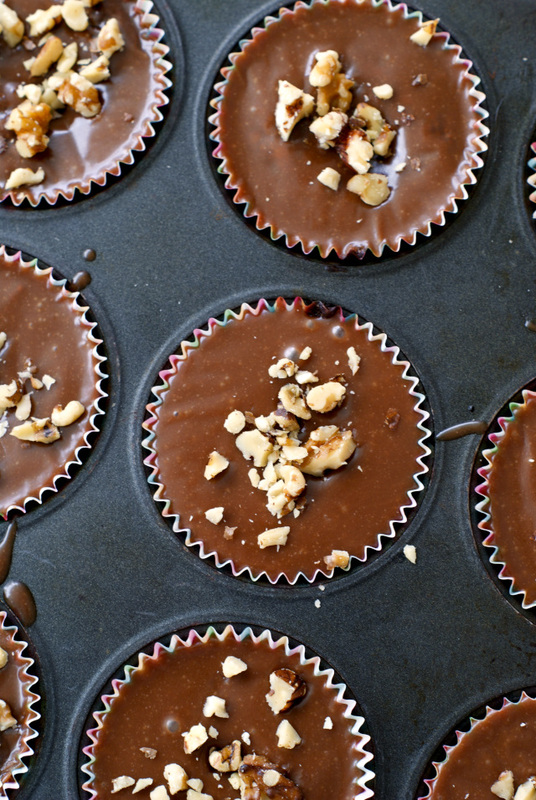 These Brownie Cupcakes are perfectly portioned, full of chocolatey goodness, and topped with a little walnut crunch. For a rich chocolate treat, they can't be beat! At least not in my book! Preheat your oven to 325 degrees. Prepare a cupcake pan with cupcake liners. Melt the Lindt 70% Cocoa EXCELLENCE Bar and butter in a medium saucepan over low heat. Remove from heat and stir in the sugar and vanilla. using a whisk, gently beat in the eggs, flour, and salt. Divide evenly into the cupcake liners. 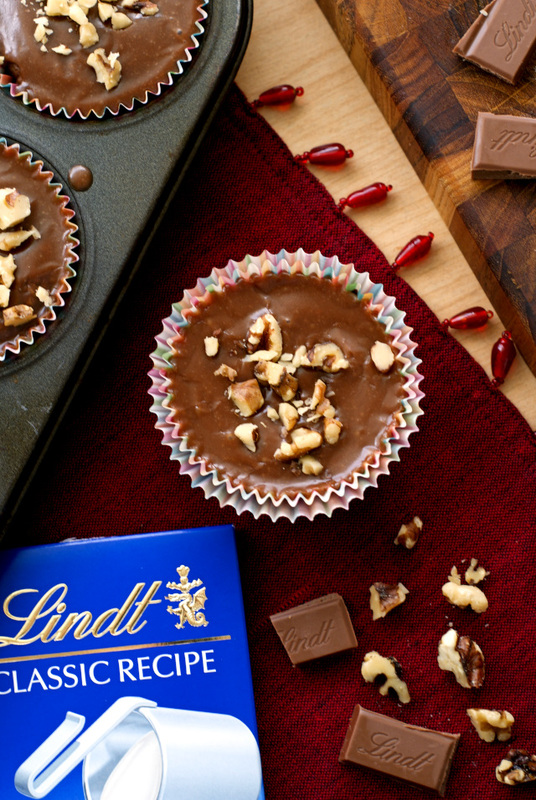 Gently press 1 piece of the Lindt Milk Chocolate CLASSIC RECIPE Bar into the center of each brownie cupcake. Bake for 35 minutes. Remove from oven to cool and prepare the frosting. In a medium saucepan, bring the milk, butter, and powdered sugar to a boil. Boil for 30 seconds and remove from the heat. Break the Lindt Milk Chocolate CLASSIC RECIPE Bar into pieces and stir into the hot mixture until completely melted. Stir in the vanilla extract. Spoon over the brownies and immediately sprinkle each one with chopped walnuts. This post is sponsored by Lindt Chocolate as a part of #Choctoberfest with Imperial Sugar. All thoughts and opinions are, as always, 100% my own. For this recipe, I recommend using Imperial Sugar, our #Choctoberfest sponsor! There is a fabulous #Choctoberfest Giveaway happening NOW! Make sure you go enter because there are over $350 in prizes to be had! Be sure to check it out! If you're a chocolate lover, I hope you'll check out some of my fellow blogger's deliciously sweet #Choctoberfest creations below!